Atherosclerosis is a disease in which plaque or buildups of fatty deposits clog the arteries. These are made of cholesterol, fatty substances, cellular waste products, calcium, and fibrin. As plaque builds up, an artery wall gets thicker and narrower, which reduces blood flow and the supply of oxygen to cells. Factors that can increase the risk of atherosclerosis include increasing age, smoking, an unhealthy, high-fat diet, lack of exercise, being overweight or obese, regularly drinking high amounts of alcohol, high blood pressure, high cholesterol, diabetes, a family history of atherosclerosis, and cardiovascular diseases. Plaque buildups may partially or completely prevent the blood flow through a large or medium-sized artery in the heart, brain, pelvis, legs, arms, or kidneys, which may lead to various diseases. These include coronary heart disease where there are plaques in arteries in or leading to the heart, angina or chest pain from reduced blood flow in arteries supplying the heart muscles, carotid artery disease in which there is plaque accumulation in neck arteries that supply blood to the brain, peripheral artery disease or plaque accumulation in arteries of the extremities, particularly the legs, and chronic kidney disease. The symptoms of atherosclerosis depend on the affected area. For carotid arteries, the symptoms may include weakness, difficulty in breathing, headache, facial numbness, and paralysis. 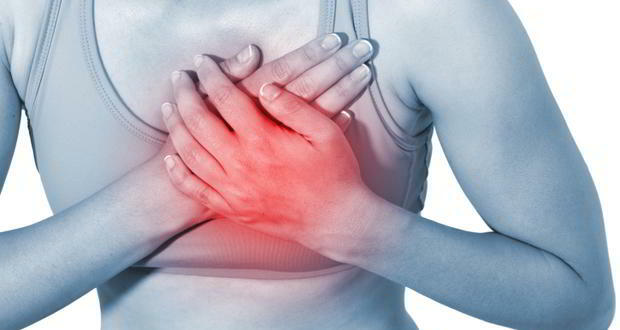 For coronary arteries, the symptoms include vomiting, extreme anxiety, chest pain, coughing, and feeling faint. Meanwhile, the person with renal artery blockage may experience loss of appetite, swelling of the hands and feet, and difficulty concentrating. The body systems harmed by atherosclerosis include the cardiovascular, respiratory, digestive, immune, and nervous systems. According to an entry published on the website Juicing-For-Health.com, the healing foods that help prevent atherosclerosis include most fruits, such as pineapple, guava, strawberries, capsicum, spinach, carrots, avocado, watermelon, and pomegranate. In addition, green vegetables and other foods that are rich in vitamins A, B, and C, antioxidants, beta-carotene, and lycopene are helpful in preventing atherosclerosis. Atherosclerosis can be treated in several ways without undergoing surgeries. One of the main treatment options is making lifestyle changes, such as avoiding cigarette smoking; eating a balanced diet that is rich in fiber and low in cholesterol, fat, and sodium; being physically active; and managing other related health problems, such as high blood pressure, diabetes, or high cholesterol. There are also medications that can prevent plaque or blood clots. However, severe cases of atherosclerosis may be treated through surgical procedures, such as angioplasty or coronary artery bypass grafting. Q&A: How do I avoid atherosclerosis and improve cardiovascular health? What if I have been diagnosed with mitral valve prolapse? Atherosclerosis is a disease in which plaque or buildup of fatty deposits clog the arteries. Atherosclerosis may cause coronary heart disease, angina, carotid artery disease, or peripheral artery disease. Atherosclerosis may cause harm in the cardiovascular, respiratory, digestive, immune, and nervous systems. Atherosclerosis may be prevented by eating healthy and making lifestyle changes, such as avoiding cigarette smoking; having a balanced diet that is high in fiber and low in cholesterol, fat, and sodium; exercising more; and managing other related health problems, such as high blood pressure, diabetes, or high cholesterol.